Everyday, thousands of new cars, trucks, vans, and SUVs roll off assembly lines the world over. They represent the newest technology and innovation their respective manufacturer has to offer, and for many buyers, will be the second-largest single purchase they make following their house. But what happens to a vehicle once its life on the road comes to a stop? The latest infographic from gocompare.com details just how automotive recycling programs are cutting back on unused waste and reintroducing the market with quality recycled materials by shredding the old family sedan for all it’s worth. Before the recycling process can begin, all fluids are drained, tires are removed, and special equipment like mercury switches and batteries are sent off for separate recycling. The tire-less, dry vehicles are then crushed and ground up. The fist-sized chunks coming from the grinder are then sorted, depending on material. At this point, roughly 15 to 25 percent of the vehicle is considered waste and enters a landfill, with the large remainder headed for further processing. Plastics and metals are two of the largest reclaimed materials from recycled vehicles. In fact, recycled vehicle plastics save roughly 24 million barrels of oil annually in the U.S. alone. Metals like iron and steel are separated with magnets while copper and aluminum are separated by weight. 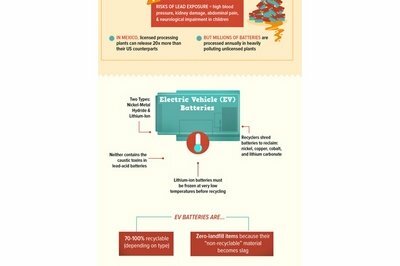 Car batteries are also a highly recyclable material and can yield up to 97 percent of its original lead content in the process. Automotive recycling is big business in America with over 12 million vehicles processed annually. Recycling is a $22 billion dollar industry and growing. That growth helps conserve resources and reduce landfill waste while expanding job growth the world over.